Topic: Long suspected, the truth is finally out! Re: Long suspected, the truth is finally out! I’ll take Full Bloom, pm sent. If it were simple, Philippe, I would have the answer. Thank you, Philippe, but I am referring to just the hardcover edition. Do you know how many of those were produced? 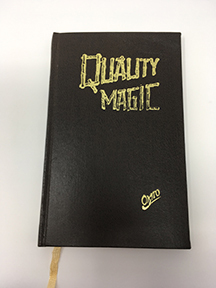 I've got a 1986 hardcover Quality Magic reprint by Exclusive Magical Publications and I haven't seen it anywhere else - in magic bookstores or auctions. Anyone have an idea of how many were printed? Well, looks like Frank came back later and said Doc Nixon beat him by six months. http://itricks.com/news/2014/02/magicia ... elevision/ also gives it to Hermalin. In Genii Vol I no3 "Frank Chapman was the first magician in the world to do magic over television. Station W3XK in 1931, just outside Washington D.C.. I understand Kuda Bux had "Kuda Bux, Hindu Mystic" on in 1950 on CBS, don't know of any before that. Dustin Stinett wrote: Mike has been working on a Dante book for quite a few years. Thanks, Dustin, I thought I had heard that. I’d love to see one along the lines of the Carter or Kellar books. Looks like Mike Caveney has a presentation about Dante at this. Anyone know if Mike has a book coming out about him? Jonathan Townsend wrote: ? Where in Apocalypse? I don’t think it will work. Like Richard, I believe that boat sailed years ago. I also don’t believe I will ever train my dogs to “go” outside 100% of the time, but I keep trying. It’s on the front page here. In these pages, I’ve tried to give back everything magic has given me...and more. Truly, all of it! Sounds like he did the same in life...he will be missed greatly. Any word on those Dollar Decks? Jonathan Townsend wrote: ….and when doing the cups trick try to remember not to call the little balls tribbles in public. Funny, I think of the tribbles as more of a sponge ball effect. I remember being mesmerized by those TV Magic Card ads when I was 5. What's in the water in Chicago anyway? In Austin, Texas there is this for musicians. Is there no similar national program for magicians sponsored by SAM or IBM? I am not discouraging individual donations as well. 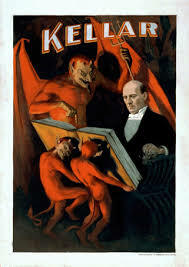 Diego wrote: If you go thru the last 100+ years of magic magazines, and/or The Billboard magazine, even during magic's "golden age", year after year, there constantly is the hand-wringing cries of, "Is magic dead?" Didn’t Max already write that one? Looks like Loftus put it out, perhaps they could help. Or it might be found in a Paul Hallas book.